Today is March 8, International Women's Day. Scrolling through my social media feeds, I've been overwhelmed by posts celebrating women from all walks of life: girls fighting the odds to go to school in war zones, a huge list of women who have won the Nobel Prize and their accomplishments, and an acknowledgement from the New York Times of all the women that didn't get proper honor at the end of their lives. In the spirit of celebrating women in our lives, this post is all about women on bikes who are changing the world. This list is totally subjective and is colored by my outlook on the "bike world." I know I left people off and might have a second edition soon. I encourage you to support these businesses, join their rides, and help promote their causes. Together, we will help reach gender equality in our day. Leah is the brains behind the With These Thighs movement. 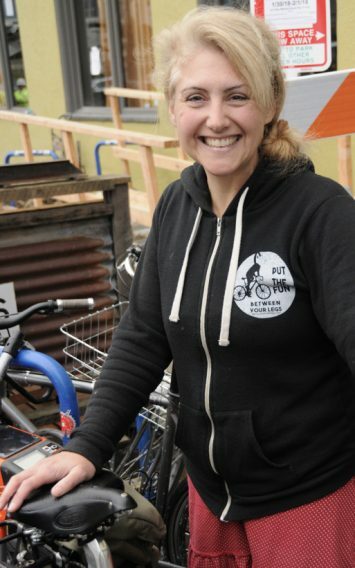 She runs Gladys Bikes in northeast Portland, which has an innovative saddle library, and is a beacon of light for bike shops. Check out this article from Bicycling for more from Leah, and go visit her when you're in Portland! I met Anna a few summers ago while on the Komorebi Olympic Adventure Route Trip. She graciously planned and brought all of the food for a trip of 7 women (and it was delicious!) She is a prolific author, penning works including "Hello, Bicycle", "Best Served Wild" and "The Culinary Cyclist." Check out her website for all of the projects she's currently working on. Whenever I meet a small person who is looking for a good quality bike, I direct them to Kathleen at Free Range Cycles. Her shop consistently stocks small bicycles, which for anybody outside of the average size range knows, can be a challenge to find. She's also a badass explorer and adventurer, last year riding the Camino de Santiago in Spain. Madi has been an inspiration to me since I started riding bikes as an adult. She is the mom of two boys and proudly lives a car-free lifestyle, with frequent updates on Instagram and Facebook of their daily adventures. She wrote "Urban Cycling", a go-to book for all things bikes and currently contributes to Portland Bike Blog for their Family Biking column. 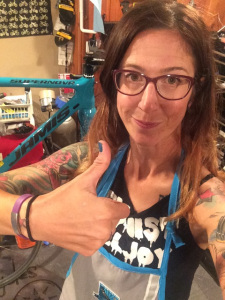 Jess is a lawyer, advocate, champion, and former bike racer. She works for Washington Bike Law and in her spare time runs the Northwest Women's Cyclocross Project, a development team for young cyclocross racers. The project seeks to assist talented female junior and U23 cyclocross racers make the transition from local success to national and international competition. Jess is an inspiration to me to continue to do good work and get more people out on bikes.